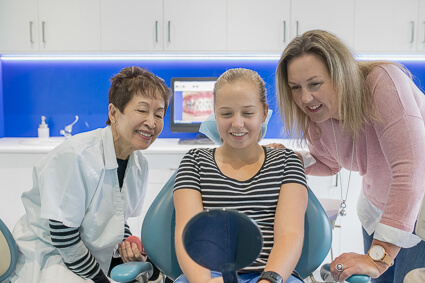 At Harmony Orthodontics, our team’s extensive training within orthodontics allows us to offer specialised treatments and high-quality results. We thoroughly assess each patient’s wants and needs to determine which orthodontic appliance or service is best for their individual mouth. After all, no two patients are the same, yet everyone deserves the successful and beautiful outcomes that Harmony Orthodontics produces. Our highly-qualified, friendly, and professional team treat patients of all ages using only the safest and most reliable materials and equipment. We pride ourselves on continuously investing in the latest oral health technology to ensure our orthodontic treatments are of the most exceptional standard. Metal Braces: fixed braces using metal brackets are perhaps one of the most popular orthodontic treatments, especially among adolescents. They are particularly beneficial for straightening a patient’s teeth and correcting their bite. Treatment can take anywhere from 6 months to a few years, depending on the patient’s condition. Lingual Braces: Although usually still containing metal brackets, lingual braces are placed on the inside of the teeth, making them less noticeable than their traditional counterparts. They are used to correct all types of bite problems. Ceramic Braces: Ceramic braces are similar to traditional metal braces, however their brackets are made from a tooth-coloured ceramic material, making them more subtle in appearance. Expander: Our orthodontist may use this appliance to widen the palate, so the upper and lower jaw will fit together properly. It stretches the centre palatal suture, giving space for developing teeth and correcting bite problems. Additionally, it may be recommended for patients who require jaw surgery. Clear Aligners: Clear aligners, such as Invisalign, are popular among patients who wish to straighten their teeth without the need for fixed braces. These aligners are almost invisible and are custom-made from clear plastic to fit your mouth. Unlike braces, they are to be removed during meal times and when brushing and flossing teeth. Removable Appliances: Removable appliances (such as plates) are usually recommend during early treatment protocols or in conjunction with other fixed appliances. This is because they may help retain the teeth in their appropriate position, as well as influence jaw growth. Precision and Accelerated Treatment: Utilizing state-of-the-art orthodontic imaging technology, treatment planning software and custom bent orthodontic wires, the advanced SureSmile system is designed to provide patients with the fastest, most accurate teeth alignment treatment possible and has been proven to reduce overall treatment times by as much as 34%. If you’re interested in discussing any of these treatments further with our professional team, please contact Harmony Orthodontics today. We look forward to assisting you on your journey to a more functional, confident, and beautiful smile!